Ex-U.N. secretary general Ban Ki-moon, HGU President Chang Soon-heung, Vice Minister Cho Hyun of the Ministry of Foreign Affairs, Chairman Lee Jae-hoon of HGU’s board of directors,; and Chairman Kim Young-gil of the UNAI Korea, attend a ground-breaking ceremony for the GEI at the HGU campus. President Chang Soon-heung of Handong Global University speaks at a ground-breaking ceremony for the establishment of the GEI. Handong Global University (HGU)’s unique educational systems designed to promote globalization have gained recognition in Korea and abroad, and they are also linked to higher levels of HGU students’ satisfaction. A survey showed that Hangdong Global University had a dropout rate of 1.3 percent in 2016, the lowest among the privately-run four-year universities across the nation, each with more than 2,000 enrolled students. HGU ranked 2nd among 149 universities each with more than 5,000 students and the lowest dropout rate among the universities located in regions other than the Seoul metropolitan area. The survey into 171 four-year universities across the nation was conducted by the E-Daily and the vernacular daily JoongAng Daily. 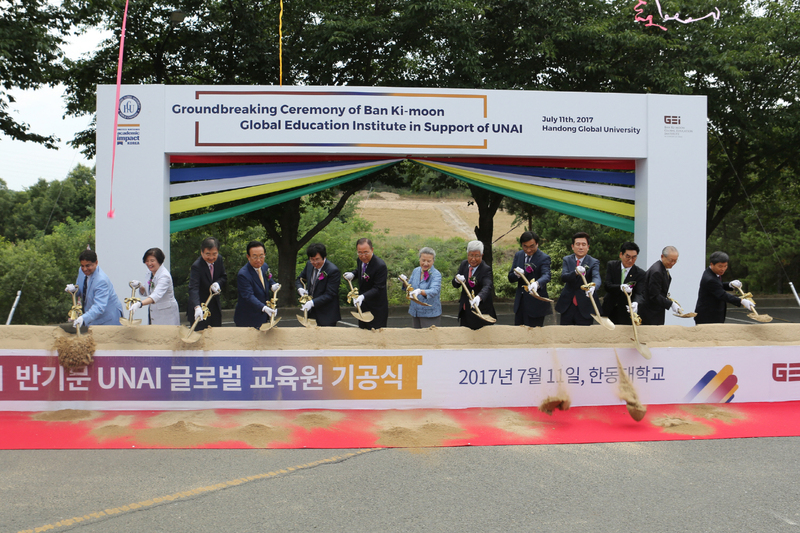 Handong Global University and the United Nations Academic Impact (UNAI) Korea held a ground-breaking ceremony for the establishment of the Ban Ki-moon Global Education Institute in Support of the United Nations Academic Impact at the HGU campus on July 11. Among those on hand at the event held at the auditorium of the All Nations Hall of the campus were Ban Ki-moon, who served as the 8th U.N. secretary general,; HGU President Chang Soon-heung, Chairman Lee Jae-hoon of HGU’s board of directors,; and Chairman Kim Young-gil of the UNAI Korea. Heads of diplomatic missions based in Korea under the umbrella of the United Nations, the Gyeongsangbuk-do governor, regional lawmakers, ranking city and council officials as well as UNAI global hub university presidents and presidents of UNAI member universities are also to attend the occasion. In a welcoming address, HGU President Chang said, “Three things on the GEI whose launch we now declare take on significance.” “First, (the GEI) is for ideas on global peace and prosperity and the nurturing of convergence and multidisciplinary manpower. The second thing is a key space for leading Sustainable Development Goals, and the third one is about HGU and UNAI Korea’s bigger roles for leading global citizenship. The event will be held in the auditorium of the All Nations Hall of the campus. The establishment of the GEI by HGU and the UNAI Korea is to continue systematic education for global citizenship. HGU is one of the global top 10 “hub” universities on education for global citizenship, selected by the UNAI. HGU and UNAI Korea aim to have GEI carry out joint study tasks to spread 10 UNAI principles in cooperation with 1,200 UNAI member universities and related institutions across the world, including 68 bodies in Korea. GEI plans to spread education in regards to global citizenship and contribute to achieving Sustainable Development Goals by promoting educational exchanges with the UNAI ASPIRE (Action by Students to Promote Innovation and Reform through Education), a body for education for global citizenship for high school and university students. HGU stresses character education based on Christian spirit under such catchphrases as one “Why Not Change the World?.” The university strives to nurture creative and talented manpower with challenging spirit and academic excellence. HGU pursues the nurturing of global talents with global achievements and leaders in the third world. HGU carries out consumer-centered education based on undergraduate education focusing on academic excellence. Handong Global University adopts an honor system to nurture students into honest and sincere talents. HGU freshmen are admitted without selecting a department regardless of college, and they undergo basic quality education after joining the Global Leadership School. HGU is famous for education in multiple disciplines for educating problem solvers and the adoption of team-teaching and project-based teaching methods. HGU has also become the first Korean university to introduce a flexible semester system in which students are allowed to get up to 12 credits when they are engaged in self-initiated tasks at companies, institutions and overseas universities instead of regular curricula. The following are excerpts of an interview HGU President Chang Soon-heung had with NewsWorld. (from left) Speakers at a ground-breaking ceremony for the establishment of the GEI are Ex-U.N. secretary general Ban Ki-moon,; Vice Minister Cho Hyun of the Ministry of Foreign Affairs,; Chairman Lee Jae-hoon of HGU’s board of directors,; Chairman Kim Young-gil of the UNAI Korea,; and Deputy Director Ramu Damodaran of the United Department of Public Information. 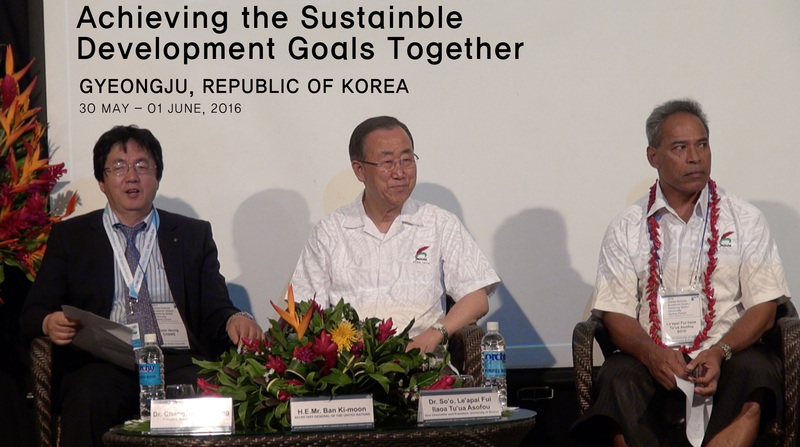 U.N. Secretary General Ban Ki-moon and President Chang Soon-heung of Handong Global University attend a session of the 66th United Nations DPI/NGO Conference held in Gyeongju, Korea, from May 30 to June 1,2016. 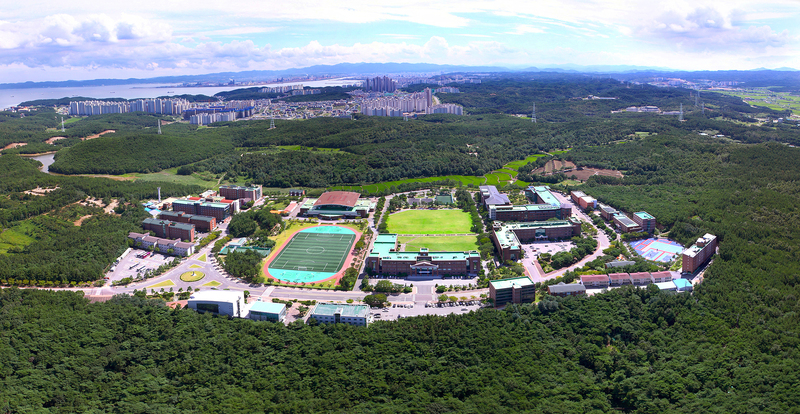 A view of a class of Handong Global University. 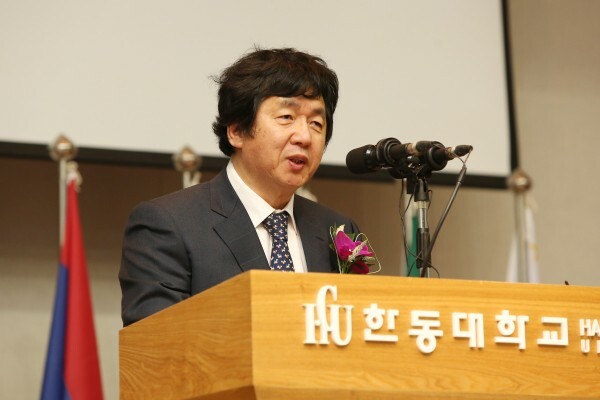 Question: According to a recent survey, Handong Global University recorded the lowest dropout rate among privately-run universities across the nation after Seoul National University. What’s the reason your students has high satisfaction? Answer: HGU freshmen are given an opportunity not only to receive basic elementary education necessary for university students for one year, without a prescribed college and major, but to search for their own major and course by taking basic subjects of several majors simultaneously. In the sophomore year, students are allowed to select their department according to personal aptitude and judgment, but all are required to complete multiple majors. This move has led to wider learner-centered selection of majors and enabled convergence and cooperation among disciplines in a respecting and cooperative fashion. Most classes take team teaching and discussion-oriented study methods to enhance educational quality and competitiveness. HGU has become the first Korean university to introduce a flexible semester system in which students are allowed to get credits when they are engaged in self-initiated tasks at companies, institutions, and overseas universities instead of regular curricula. The university stresses the nurturing of talented manpower with the knowledge of sites and those who are capable of addressing problems in an era of self-initiated learning capabilities. Through team meetings, team leadership training, and the Residential College (RC) system, students are taught about living together and sociality. HGU carries out the RC system to create an environment in which study and life can be harmonized as a community in pursuit of unifying study and life. The RC has been employed for general education, and the conventional team system has been operated efficiently with a dormitory serving as an educational ground to be set up as an integrated, efficient educational example. HGU students can not only learn ways of understanding and respecting roommates who have grown up in a different environment while staying at the dormitory, but also acquire an etiquette of serving — HGU’s vision. HGU students, staying away from parents’ full concern and caring, can find themselves getting more and more mature through life together with their colleagues by leading an independent life based on their own self-life control and responsibility. HGU has a team system that has never been seen at other universities. A 35-member team is a small community with a focus on a professor-in-charge. HGU students accumulate mutual trust and love through mandatory work and team meetings during a one-year dormitory period. Even though they quarrel sometimes, they can learn how to share their dreams and visions each other. Each professor-in-charge shares an honest life and love as if the professor looks after students as members of a family. The university boasts a professor-student relation full of love and trust. HGU’s community leadership training (six semesters) is a program in which each team under the stewardship of a professor-in-charge is engaged in a joint study program they select for given hours for one semester. The program, including required labor, volunteering activities, reading/discussions, theme-based seminars and bible study, is designed to nurture leadership with all team members participating in creative activities or serving team members. The purpose of the program is to help the professor and students, and students share their faith, life and thoughts, respect and support each other to inherit HGU’s spirit and lay a foundation to bring about development activities. 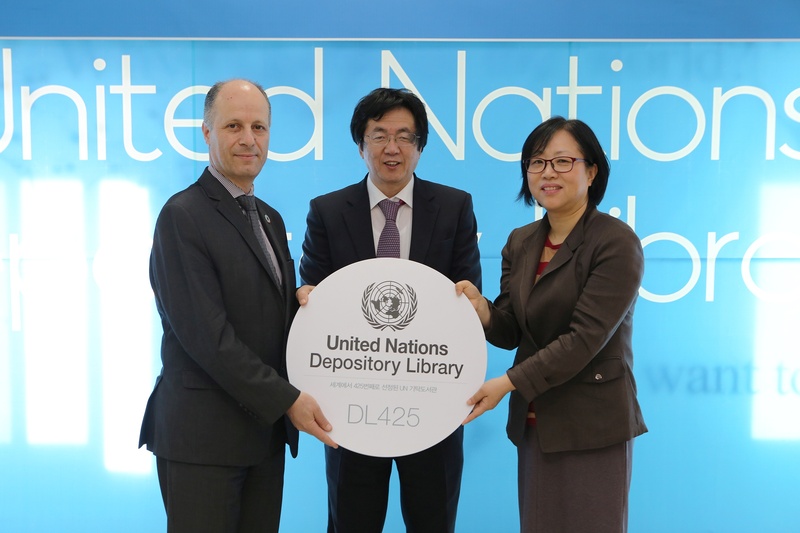 President Chang Soon-heung of Handong Global University, Director Maher Nasser of the United Nations Information Service, and Kim Kyung-mi, head of HGU’s academy and information office participates in a ceremony to put HGU’s library to the list of U.N. Depository Libraries in 2014. 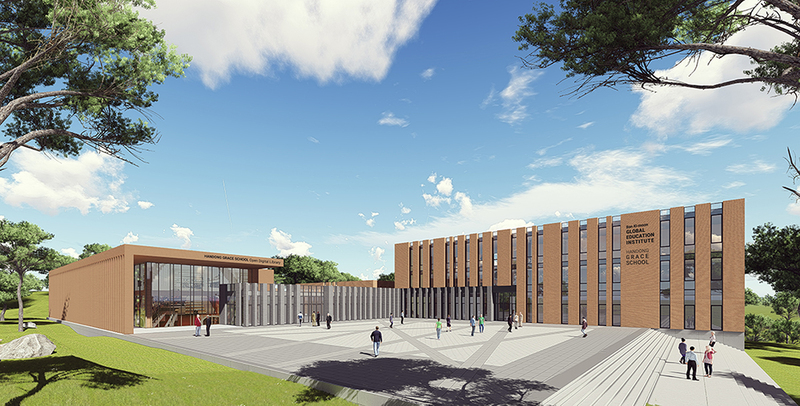 A bird-view of the the Ban Ki-moon Global Education Institute Building, to be built on the campus of Handong Global University. Q: Will you elaborate on a plan for the establishment of the Ban Ki-moon Global Education Institute in Support of the United Nations Academic Impact (UNAI), known for GEI? Will you introduce joint projects your university has so far carried out with the United Nations? A: The establishment of the GEI by HGU and the UNAI Korea is to continue systematic education for global citizenship. HGU is one of the global top 10 hub universities on education for global citizenship, selected by the UNAI. HGU and UNAI Korea aim to have GEI carry out joint study tasks to spread 10 UNAI principles in cooperation with 1,200 UNAI member universities and related institutions across the world, including 68 bodies in Korea. GEI plans to spread education for global citizenship and contribute to achieving the Sustainable Development Goals by promoting educational exchanges with the UNAI ASPIRE (Action by Students to Promote Innovation and Reform through Education), a body for education for global citizenship for high school and university students. Meanwhile, HGU’s differentiation education for globalization has yielded tangible outcomes. HGU, being a global hub university of UNAI, has been selected as a university for UNESCO University Twining and Networking. HGU was one of the organizers of the 66th United Nations Department of Public Information (DPI)/Non-Governmental Organization (NGO) Conference, which took place from May 30 to June 1, 2016 in Korea, the first one in the Asian-African regions. HGU President Chang Soon-heung served as chairman of the organization committee of the UN NGO conference. The UN NGO conference, coinciding with the UN’s 71-year history, is the most reputed, heritage event representing civic society spheres across the world. The conference is a network of representatives of 1,500 NGOs registered with the DPI, the UN Secretariat body, designed to discuss major international cooperation issues. In particular, Korea’s hosting of the 66th UN DPI/NGO Conference for the first time in Asia and Africa took on significance as it contributed to raising the nation’s standing to the international stage. The conference, held under the big tile “Education for Global Citizenship,” touched on four pending tasks — the rights toward easily accessible, safe, inclusive study space; a driving force for the achieving of Sustainable Development Goals; children and youth: future global citizens who live in now; and global citizens protecting the earth: energy, environment and climate change. HGU hosted the 2014 U.N. Academic Impact-Handong Global University Samoa Forum on education in small island countries in Samoa in 2014. The meeting took place from Aug. 31 to Sept. 1, 2014 at Tanoa Tusitala Hotel Conference Centre, Apia, and Samoa National University on the margins of the Third United Nations Conference on Small Island Developing States in celebration of the 70th anniversary of the UN. While delivering a commemorative speech at the forum, UN Secretary General Ban Ki-moon stressed the need for educational support to achieve Sustainable Development Goals. He called for leading roles of the UN Academic Impact, giving HGU’s hosting of the symposium a significant meaning. HGU’s education is tailored for globalization. All of the university’s major courses are conducted 100 percent in English. HGU undergraduates are offered a chance to serve as interns at the OECD headquarters in Paris under a contract with the OECD. 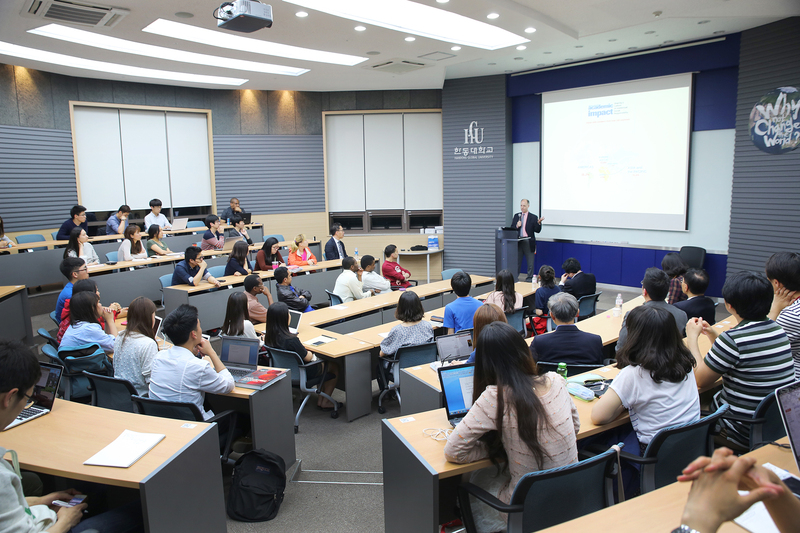 In particular, the Handong International Law School (HILS) has become the first Korean institution to introduce a U.S. law school educational course. HILS has opened a course allowing graduates to apply for an American lawyers’ examination. Currently, 336 HILS graduates have obtained an American lawyer’s certification. In 2014, HGU’s library joined the list of U.N. Depository Libraries. Q:Will you touch on the purpose of software-centered HGU and its current status? A: The main feature of HGU’s software-centered projects is to nurture manpower suiting the advent of the 4th Industrial Revolution essential for software innovation. They aim to imbue each talent with expertise and connect them with industrial companies. To this end, HGU is to establish the IT Convergence College with the goal of establishing a network of collaboration between industry and academic circles. All students will be required to take education on coding regardless of their major, and the requirement of a multiple major system, now in place, will be expanded to select software as one of the majors. Furthermore, the university plans to accelerate efforts to spread the regional community’s mindset on software by inaugurating a software educational volunteering team charged with reeducating tutors, teachers, public servants, and companies and sponsoring projects involving primary students. The selection of the project is significant to both HGU and the region. It will serve as an opportunity to change the image of Pohang into a software-centered city. HGU has a smart campus in place. Eventually, a software-centered campus town is hoped to be set up near the campus.